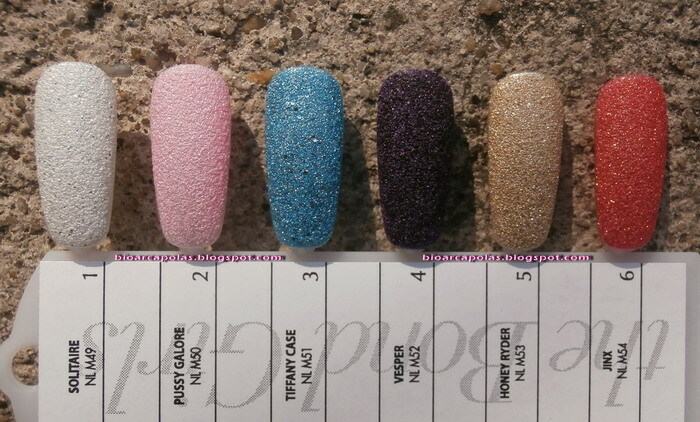 The Polish Jinx: OPI Bond Girls Liquid Sand Collection! So I am so beyond excited by this collection I had to share it with you. 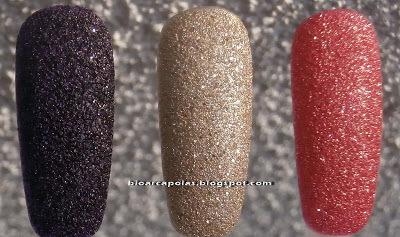 I have really really loved the liquid sand polishes (the look, the feel AND the wear). So to see a full collection of them coming out is super exciting. Now I had taken these three images off of two different blogs and I was going to credit both blogs, but it seems that both blogs took the images from the same spot. And only one credited the original source. SO for the original info, check out THIS POST. There are more pictures available there!! So what do you think? I KNOW I need all but the pink one. I would say I dont need the red one (I am not a red person) but ITS NAMED JINX!!!!!!!!! Now for those of you who dont know where Polish Jinx or Blue Jinx came from, here is the story. I was setting up my IRC (yes, I said IRC. And I still use IRC. Im kind of a dork!) and needed a handle. I had just gotten home from a date that involved the newest at the time Bond movie. I had Halle Berry's character in my head and her explaining that she is a Jinx to everyone she meets and said "Im going to be Jinx! It fits!!". Sadly Jinx was taken and my date said "every thing you like is blue. Be bluejinx". And BlueJinx was born. Which became the Polish Jinx when I started this blog. So as you can see, I really NEED to have the POLISH called JINX! I can honestly say - this is one trend I'm skipping. I was hesitant about the Liquid Sands and Pixie Dust at first, because a lot of the swatches made them look very dried out. I'm glad I took the time to check them out in person, because now they've become a favorite of mine! 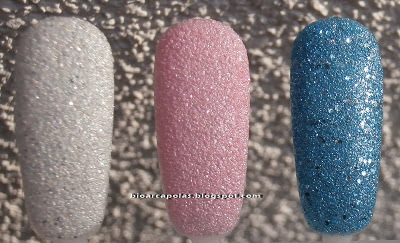 The thing I like the best about the LS/PD is that you can get 3 different looks from just 1 polish (Yes, I said THREE) Obviously, any nail-gal that's worn any of these polishes knows that adding a topcoat gives it a whole new look. But by whim, I also discovered another way to alter their finish: What happened was, I couldn't stand the thought of not using a topcoat. So I thought if I put a mattifying topcoat on, it wouldn't ruin the texture. I was wrong! lol! But my mistake paid off, because it looked really neat - like texture encapsulated in gloss (comparable to the way a sparkle polish looks when you top it with a layer of jelly polish). I love these sand polish trend.the regular ones doesnt seem to last on me for at least 3 days even with a base and top coat. I purchased the mariah for opi and i must say they are the best!